This game includes twenty original Sherlock Holmes adventures. The object is to go around the board and gather clues. Once you solve all 20 cases, there are several more sets full of new cases. Additional cases for the game are also available. A future world of human misery, squalor, oppression, disease, and overcrowding, sets the tone for Android, a board game of murder and machination. Players take on the roles of one of five detectives, each with his own strengths, weaknesses, and personal demons. These detectives are given two weeks to to solve a mysterious murder case. between the city of New Angeles and moon colony Heinlein chasing down leads, calling favors, and uncovering the sinister conspiracy beneath it all. In addition, the detectives will have to deal with problems that come up in their personal lives. After the murderer has been revealed, Victory Points are tallied and the player who has best managed all of the tasks listed above will come out with the most and solve the mystery of Android! Based on the best-selling series of books, this game pits teams of players against each other in a race throughout the world. To win, a team must visit four mysterious locations and gather enough clues to unlock the secret chamber. 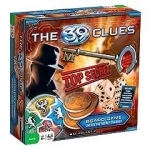 In The 39 Clues: Search for the Keys board game, players race around the world gathering keys by solving clues, decoding messages and tripping up the competition. The first player to collect 4 keys wins. Sound easy? Well think again. Be ready to match wits with other players as an international journey of discovery and chicanery is revealed. Let's begin the adventure; the hunt is on! Evenings at Nick's Cocktail Lounge were comfortable and friendly. But this particular night was different and the Piano man playing softly in the background wasn't the only entertainment...there were also many colorful characters at the bar, providing quite a charged atmosphere. They could have kept you entertained all night just being themselves. But tonight these intriguing characters found that the real main attraction would be - murder! Includes a poarty planner with instructions, costume suggestions, tips, optional dinner menu, invitations and name tags for your guests, character profiles with secret backgrounds and clues, a CD re-enactment of the murder and plot outline, and the author's solution to the mystery. Betrayal at House on the Hill is a new twist on terror! The rules are very simple and the game plays at a fast pace. Players build a house of terror one tile at a time, so it's never the same game twice. As one of twelve mysterious characters, you'll explore a house filled with deadly secrets building up to an event called "The Haunt". As you explore you may be faced with any number of horrific scenarios. Ravenous cannibals with you at the top of their menu. Transportation to another dimension by malicious aliens. Even a chess match with Death himself! As if that wasn't enough one of your fellow players will betray you! The traitor will test your sanity as you use all your skills to survive. With fifty fiendish scenarios, Betrayal at House on the Hill is the board game that puts you face to face with legendary monsters, modern nightmares, and your friends! The evidence is clear, CSI: The Game is even more fun than the hit TV show! Join the TV show's characters to collect evidence in all 7 crime lab divisions: interrogation, autopsy, identification, trace, ballistics, forensics and DNA. As you navigate the gameboard, you'll use cutting edge scientific methods and old-fashioned police work to build a case against one of three suspects. The first player to enter Grissom's office with a correct Arrest Warrant proving means, motive and opportunity, wins. Game features eight classic CSI-style crime stories. Includes suspect and evidence cards, arrest warrant/checklist pads, and a CSI handbook packed with descriptions, crime scene photos and more. For 2-4 players/teams. Ages 13 to adult. One of the most popular and critically-acclaimed series in television history is now a game you can play at home! Players become detectives and compete to solve realistic cases as they travel around the board. Interview witnesses, interrogate suspects, gather evidence and collect clues as you try to unravel the case. First player to correctly identify the suspect wins. Features four complete cases with different possible solutions. 2-4 players, ages 13 and up. Do You Have Da Vinci's Masterpiece? The Mona Lisa Mysteries Game is based on the real events from 1911 when the Mona Lisa was stolen from the Louvre! Players act as wealthy art collectors who bid on the services of art "experts" to rate their copy of the Mona Lisa. Through careful strategy and market manipulation, the player with the highest valued Mona Lisa at the end of the game has the "real" Mona Lisa and wins the game. Each time you play a new game the experience will be fresh and unique. One player takes the part of Mr. X and slinks around the city, leaving clues for the others who are the Scotland Yard detective team. Was the elusive Mr. X last seen at Buckingham Palace or Madame Tussaud's? Did he travel by bus or taxi? Strategy skills and teamwork will help Scotland Yard players trap Mr. X and win the game. If, on the other hand, Mr. X manages to escape capture, he wins! Includes playing board, log book, one visor, six playing pieces, 20 cards, 125 travel tickets and instructions. Simply Suspects is a fast-action game of suspicion and finger pointing. Much like Spy Alley, Simply Suspects is deceptively ssimple yet surprisingly intense. The advantage that one player may appear to have can change with a single move. You are never sure which suspect will escape the Grand Jury and win the game. For 2-6 suspects. A mystery jigsaw puzzle game. Read the story, assemble two puzzles and solve the murder. Sounds easy? Well, consider this: the two 500 piece puzzles, the before and after evidence of the crime, come in the same bag! Also, be warned: The box cover is not the same as either of the two puzzles. Even after you put the puzzles together, there's still the mystery to solve. Hours of head-scratching fun. Available games: A Is For Arson, B Is For Bullet, C Is For Chocolate, D Is For Diamonds, E Is For Espresso, F Is For Feline, G Is For Golf, and H Is For Housewives. See Also: Mystery Game Central features the world's largest database of mystery games, including Mystery Board Games, Mystery Party Games, Mystery Software, Mystery Jigsaw Puzzles, and Online Mystery Games, as well as mystery game news and a comprehensive collection of mystery game links.